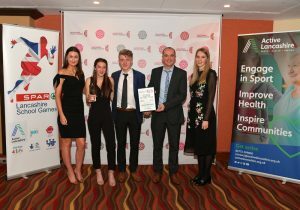 This award is given to an active and well run sports club that has undertaken great work in running development programmes which attract and retain participants, particularly those from under-represented groups, and which help their members to develop their sports potential. The winner of the Club of the Year Award 2018 was Clayton-Le-Moors Harriers. The club was set up as a juniors section of Clayton Harriers by Marion Wilkinson in 2009. The aim was to give any child of any ability a chance to join a running club, all that is asked of participants is that they are committed and work hard. It is not just sports skills that are taught, but skills for life including team work, resilience, strength, determination, rising above adversity, pride and humility. The club welcomes all juniors from age seven upwards. With no permanent base, Clayton-Le-Moors Harriers train from several different venues across Burnley each week. Membership is open to all regardless of ability and they endeavor to make all their juniors feel welcome.